Beauty and versatility are what you can expect from these honed marble natural stone wall tiles. Use them in kitchens, baths and even outdoor spaces. Combine with glass elements, metallic accents and intricate mosaics to add spectacular detail to any installation. Buy online Jeffrey Court Carrara 3 in. x 6 in. 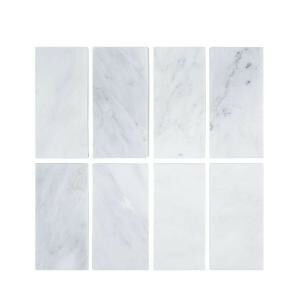 x 8 mm Honed Marble Wall Tile (8-Pack) 99090, leave review and share Your friends.